Glaciers slowly carved the Fjords of Norway out of hard-rock coastal mountains. The resulting narrow fjords are walled in by incredibly steep cliffs, verdant slopes and snow-capped mountain tops. To get a sense of scale, note the boat in the photo. It may look like a modest yacht but is a large ocean-going ship. If you have time to visit only one fjord, let it be Sognefjord, which is only about 70 kilometers (45 miles) north of Bergen. It stretches 204 kilometers (125 miles) inland, has stunning fjordscapes, and small villages. It's one of the arms of Sognefjord. Naeroyfjord, is a tourist favorite because of its narrowness and skyscraping cliffs. It is much farther north of Bergen (and is much shorter in length) than Sognefjord, but is worth the journey. Many Norwegians consider it to be their country's most beautiful fjord. It is blessed with many tall, cascading waterfalls (the Seven Sisters is the most striking). 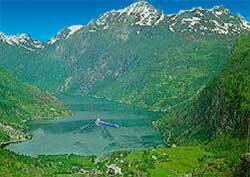 Partially because of its significant depth, Geirangerfjord is a pet among the large ocean going cruise ships. It is famous for Pulpit Rock, an outlook with the grandest view in the Fjords of Norway region. It requires a long uphill hike. Standing at the edge of Pulpit Rock, you look 600 meters (2000 feet) straight down into a majestic fjord. Lysefjorden lies south of Bergen. Its fjordscape is dramatic, but less so than those of Sognefjord and Geirangerfjord. However, its low lying farms, orchards, and grazing slopes lend a lovely rural touch to the landscape. Hardangerfjord is south of Bergen.